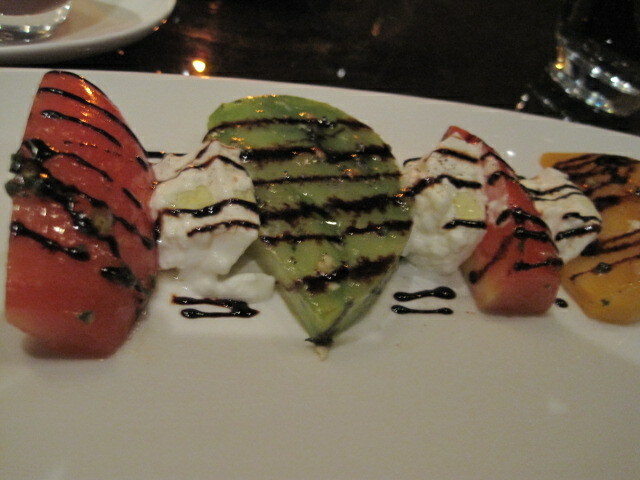 R and I both got the Tomato & Burrata Salad, (creamy burrata cheese, basil and oregano, balsamic reduction). My friend does not like tomatoes (What is it with skinny girls and tomatoes?? I say this with love ;), but she did enjoy these. She said it was like they weren’t really tomatoes. Maybe the green and yellow tomatoes have a more subtle taste than the red ones or the balsamic covered up that tomato taste? I enjoyed it mostly because of the fresh burrata cheese. 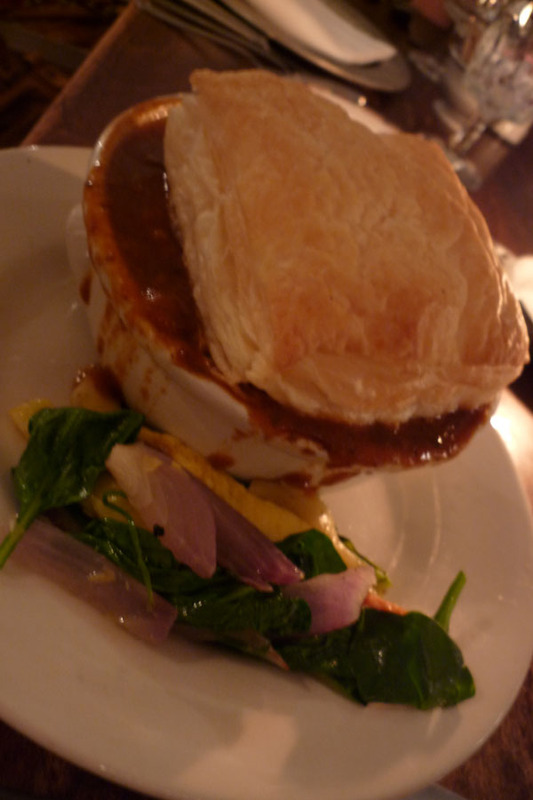 With the tomato they complemented each other very well and the reduction was just an additional flavor. 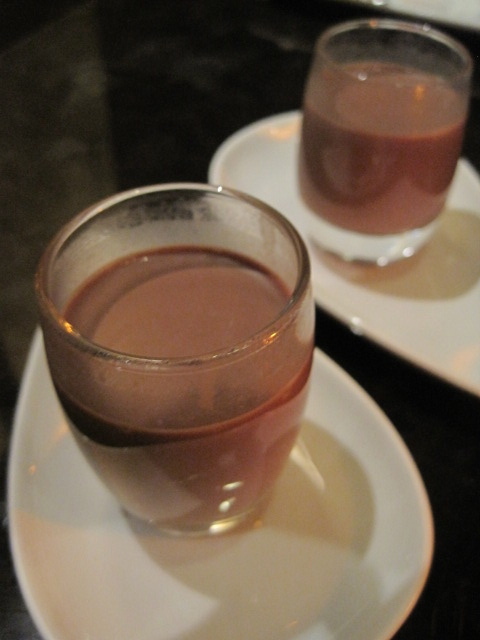 So, Co Co Sala is known for their chocolates of course– we also started off with their Co Co Amuse, a dark hot co co. sip of Amuse Chocolat. This is not hot chocolate. It is DRINKING chocolate. Oh mm, I can taste the delicious swirls of chocolate in my mouth now, genuine, true, natural, sugary goodness. 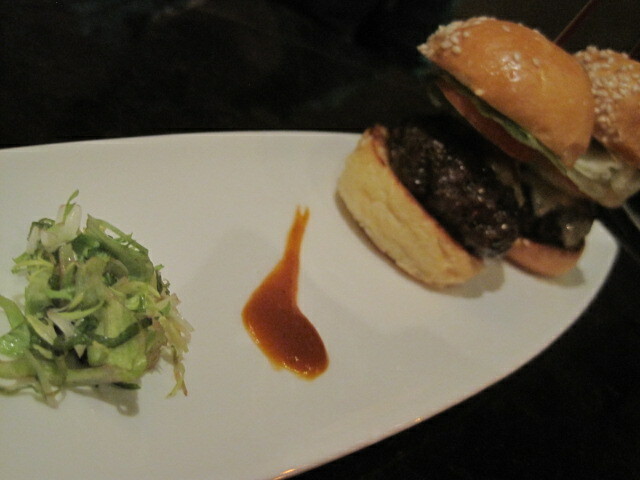 The Beef Sliders were very juicy: Meyer Angus with their special mole sauce and the usual burger fixings. 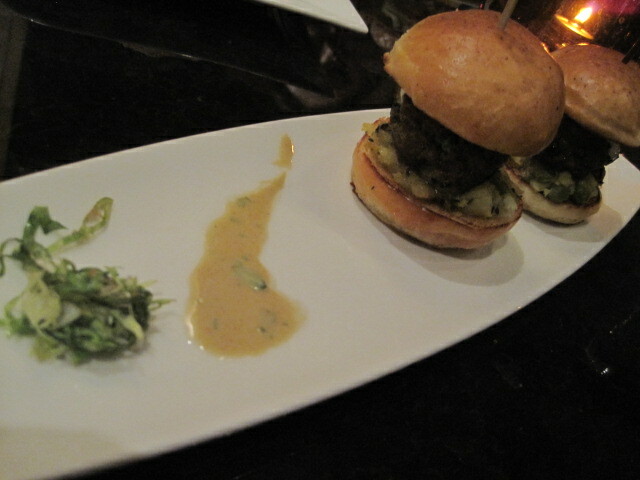 The Lamb Sliders were spicy, like Indian seasoning– cumin and curry: curry and coconut organic lamb with lime yogurt creme. 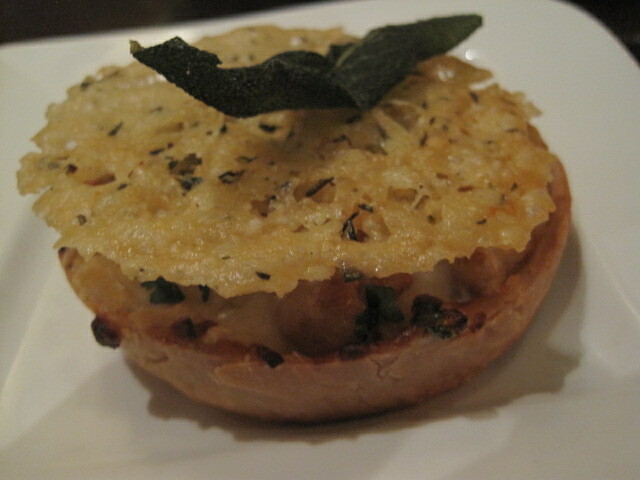 My first time at Co Co. Sala, I ordered their famed Bacon Mac & Cheese, BUT this time I got their Mac & Cheese Tart. This version used elbow macaroni, cheddar and parmesan, and fresh sage. 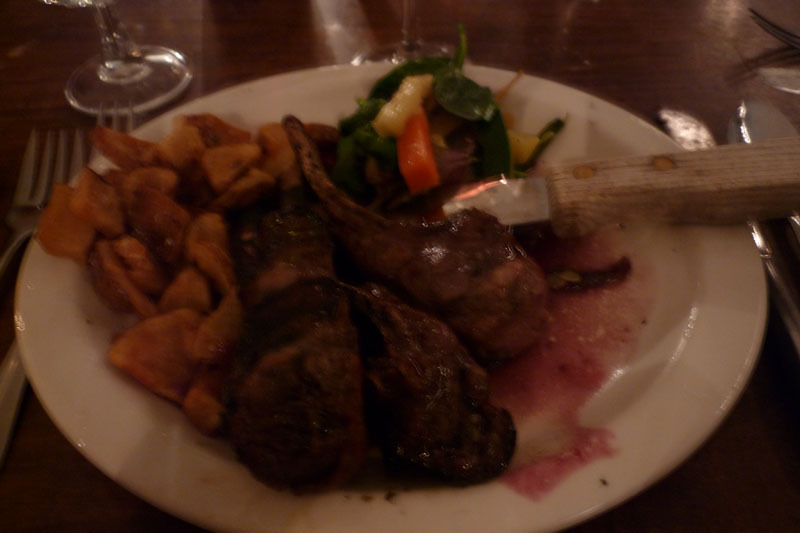 Pretty good, I can honestly say by this point I was getting pretty full. 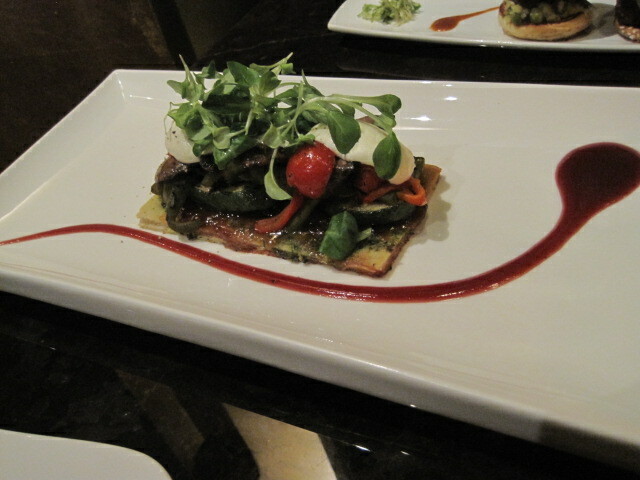 Friend ordered the Portobello Flatbread: Portobello mushrooms, goat cheese, roasted peppers, kalamata olives, and fig marmalade. This was incredibly flavorful. I could really taste everything in its own right. The only thing I did not notice was the flatbread as it was drenched in everything else’s flavor, but I’m not complaining! 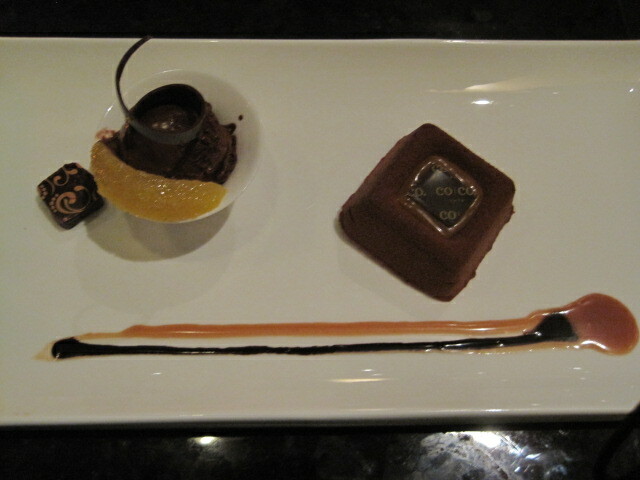 Chocolate Onyx: Dark chocolate mousse, vanilla creme brulee, salted caramel, crispy chocolate pearls, brownie, chocolate sorbet, 72% cacao bon-bon (description from their RW menu). The mousse was crisp on the outside and succulent on the inside. It really just melted in the mouth. Just take a look at the close-up below. The chocolate sorbet was like pure chocolate. Neither of us could finish that, and I didn’t even touch the bon-bon, but I think my friend managed one bite. The Sticky Situation was my choice. 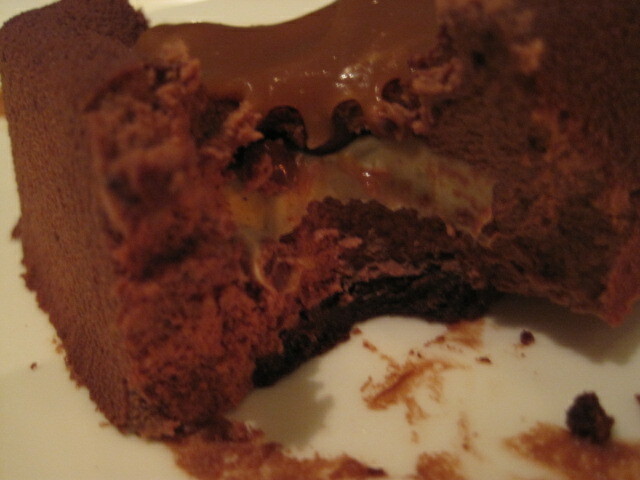 Maybe I shouldn’t have gotten this because of the braces, but I really couldn’t pass up the chance of dining on toffee. 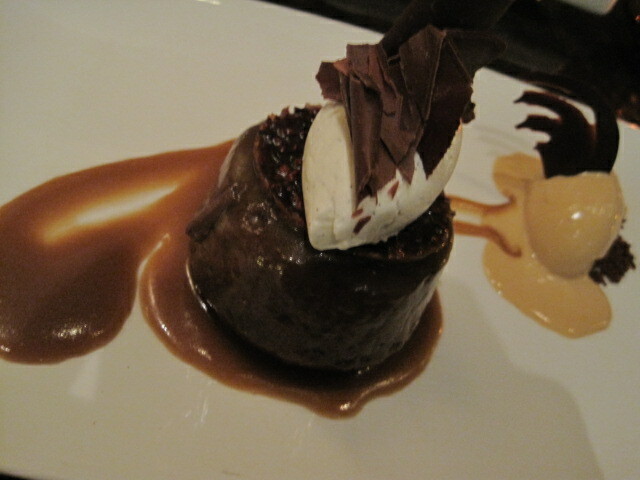 It consists of warm sticky toffee pudding cake, brown butter toffee sauce, and ginger caramel ice cream. I loved everything about this dish except for maybe the ginger caramel ice cream. It started melting immediately upon arrival and I couldn’t eat it by itself because of the bitter taste. The top piece of toffee was VERY sticky and difficult to cut through or chew. You better have good teeth and brush right after. The toffee pudding itself was so good. For me, it wasn’t too sweet, and it had enough of that toffee flavor but not so overwhelming. 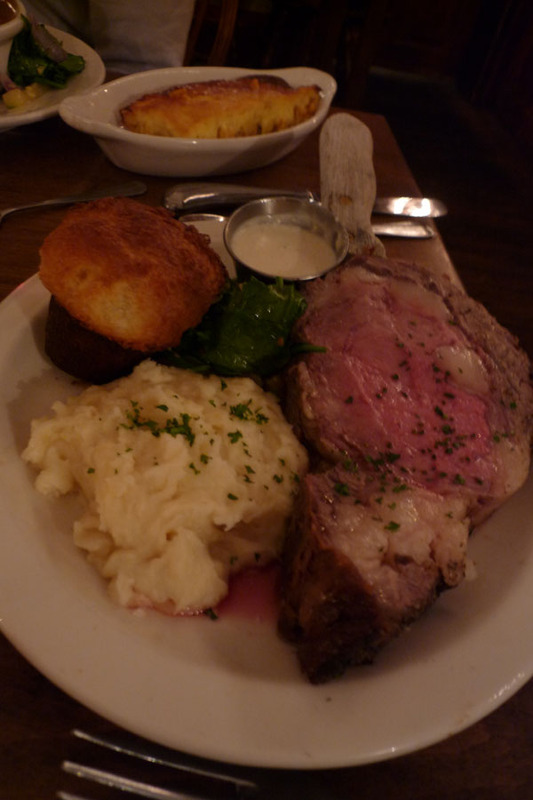 MM, I miss it already. All in all, Co Co. Sala is a dimly lit, intimate, Chocolate restaurant with spiced tapas to compliment all the sweet stuff. It’s a romantic setting and dare I say, posh. 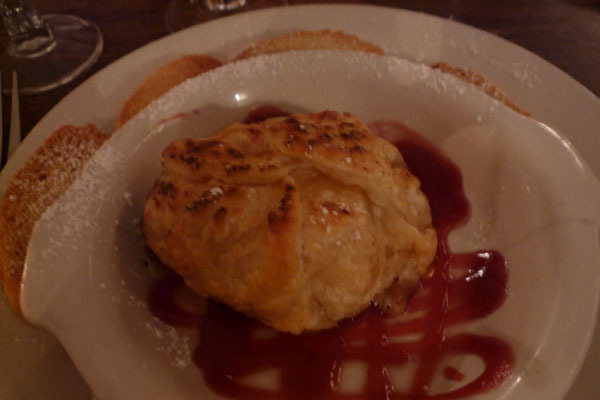 Check it out, especially for dessert!